where several lifts and gondolas meet. 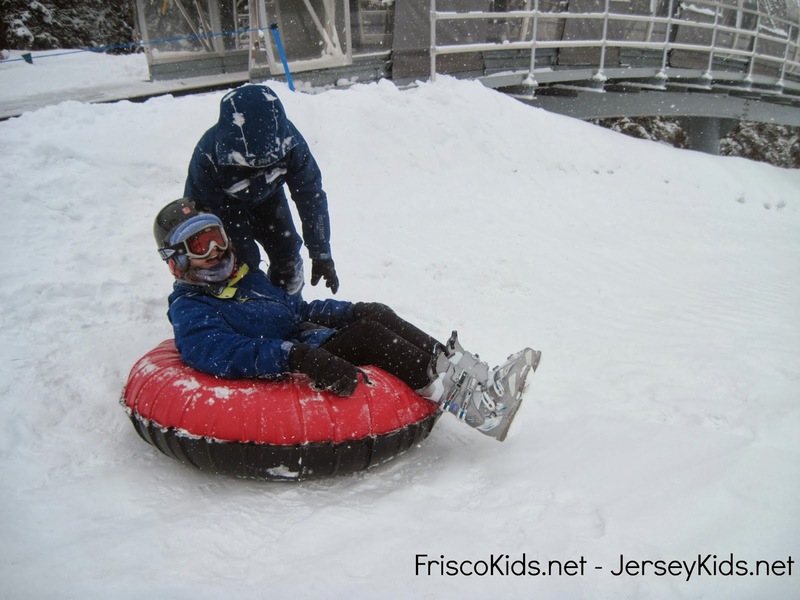 You don't have to ski to get to the top, but you do have to either pay for a gondola ticket if you're not skiing, or get a spot in a summit snow tubing session, which includes the ride up. 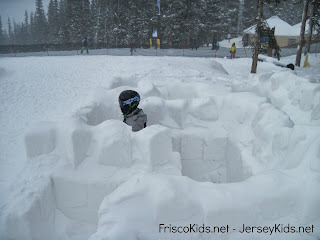 The snow fort is right next to the Adventure Point tubing area. 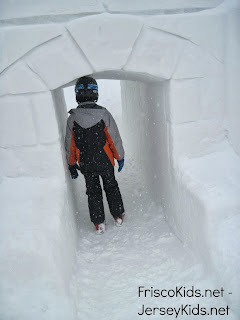 My son walks through the snow fort entrance. The fort has a maze with blocks of ice. At the end of the maze, you slide out through a tube. This is one of Keystone's many ice sculptures. 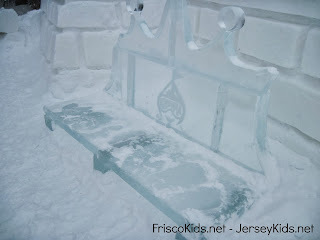 You can sit on this gorgeous Kidtopia themed ice bench in the fort's center. My daughter managed to slide out after the maze. This slide/tube is big enough for adults, but it was hard for her to get up once she came out! 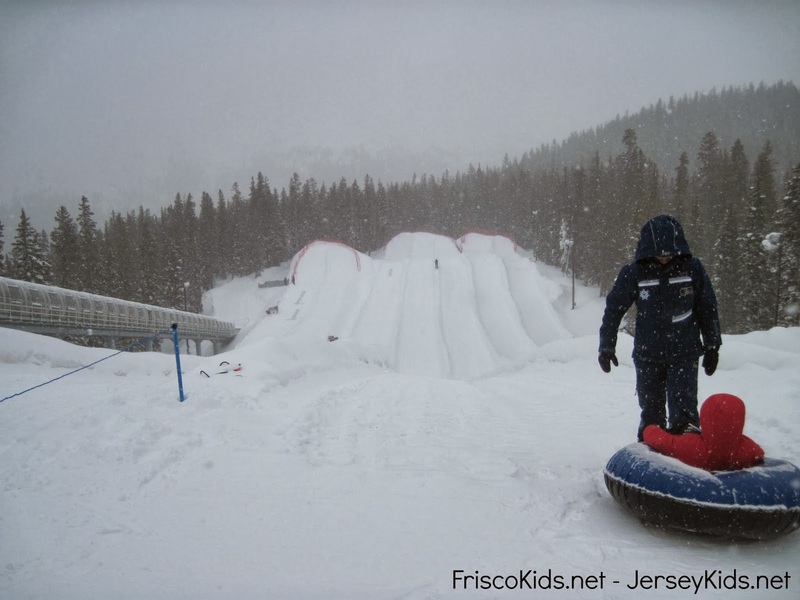 Initially we didn't want to go tubing, because it was going to cut into our ski time. Then we found out that the Adventure Point tubing was on top of the summit. We could ski over there and tube for an hour, without having to leave the slope, and we did a run before and several runs after. We signed up for an hour session, which was $31/person. 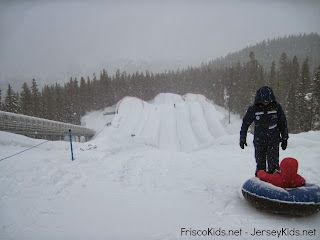 The price seemed kind of steep (no pun intended) for an hour of tubing, but I could not believe how many staff members worked there. 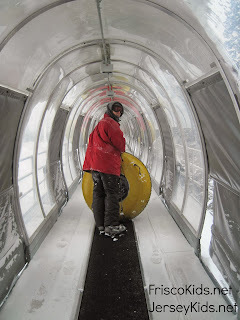 They had 1-2 people on each lane at the top to push you, people down below to monitor and photograph, employees a the bottom and top of the magic carpet, and many others who were clearing snow and doing general upkeep. They say you can fit in 3-4 tubing runs during your hour session. They were practically empty when we were tubing on a Saturday morning at the 10:00 session (capacity is 120 guests), and we got in at least 8 rides, and could have had a few more if I had not gone to the nearby restroom, and taken a break to check on my son (who went back into the yurt headquarters because he was cold). The employees there were super friendly and actually seemed to be having a great time up there. They were chatty and asked if we wanted to be spun or just go down straight. And they remembered our preferences when we came back. The magic carpet ride brought us back up to the top, and it was a surreal ride. I was grateful not to have fallen off during my journey. They have a Keystone Epic photographer roaming around the tubing area. I knew you could order pictures inside, but I didn't realize you could have your pictures tagged with your Epic card and put on your EpicMix account, for free sharing on social media later. For $40, you can download all pictures they take of you at Keystone (including ones of you taken at the summit when posing with the gorgeous backgrounds of ski mountains). The photographer took some good shots of us, but I didn't have him tag us. Oh well! The hill is open during night skiing, and sometimes they offer Disco Tubing, with special music and outfits worn by the staff. The hill offers several different runs, and we were told it was longer than a football field (or was it longer than several football fields???). In any case each lane is different, with the first one being the fastest, going progressively slower as you continue down to each lane. Here's a hint: the walk from the bottom to the magic carpet ride is the shortest for the first lane, and MUCH MUCH longer for each subsequent lane. I was getting winded walking from the third lane to the magic carpet, at the 11,500 foot summit. 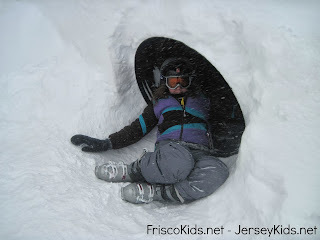 You're allowed to wear ski boots for tubing, but if you do so, you cannot join with other tubers to go down together. If you're wearing regular boots, you can have as many as four tubes joined to go down together. 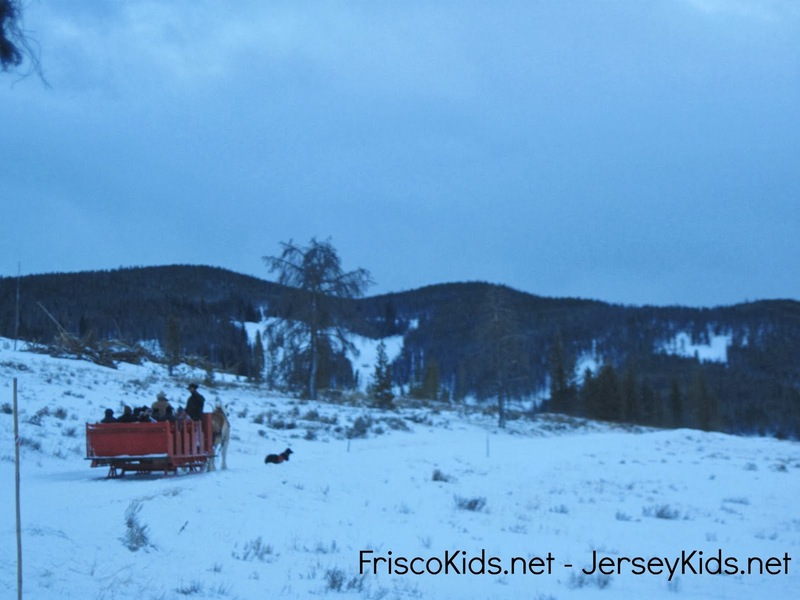 We were so excited to go on this sleigh ride, but slightly nervous because it was a very cold and windy day. We started off at the Adventure Center at Lakeside Village, near the Keystone Lodge. This overlooks the gorgeous ice rink you'll see at the very bottom of this page. After checking in, we took a 15 minute bus ride to the sleighs, looking out at some gorgeous and likely very expensive huge homes on the way. 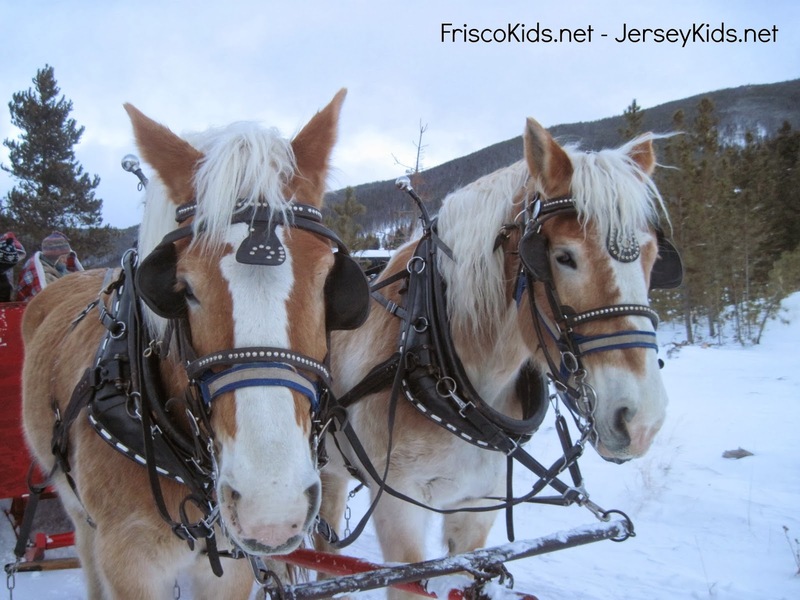 We piled into the sleighs and got warmed up with fuzzy blankets. Our guide gave us the history of Soda Creek Valley, which we rode through, in addition to telling us about the Belgian draft horses that pulled us. 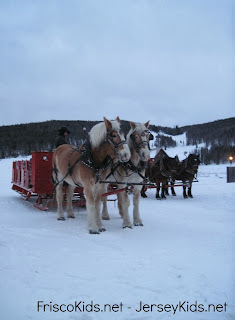 These are 1,800 pound horses who can pull double their weight. They eat something like 40 pounds of hay a day, drinking 10+ gallons of water. They love the cold weather. These horses huddle up together at night in their barn, sleeping maybe four hours a night (they can doze while standing, or lie down for maximum rest). 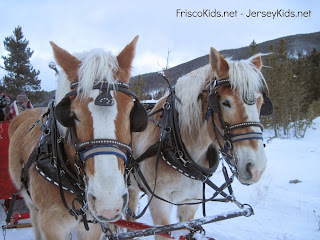 The valley has of course changed hands over the years, acting as a mining area, ranch, dude ranch, homestead, and now it's part of the national forest, with access allowed for Keystone. It's also elk breeding ground, though we didn't see any elk unfortunately. The guide said they saw some the previous evening, not far from the sleigh. The sleigh in front of us was accompanied by a dog running along side it. "What's the dog's name?" someone asked. "For $25, it's name is 'Sold,'" he answered. Much of the evening was like this, with corny humor. The cabin where we ate dinner. We saw some piles of wood, which were from cleared trees, as a fire prevention measure. We approached the cabin where we were having dinner. It had been rebuilt after it was destroyed, I think in the late 90s. An original 1800s cabin was still there, albeit with a brand new roof. We were warned ahead of time that there was no flushing toilet on site, and I managed to do just fine without. Those who visited the outhouse found it was much nicer than what I grew up with from camping. The meal started with barley beef soup and biscuits. 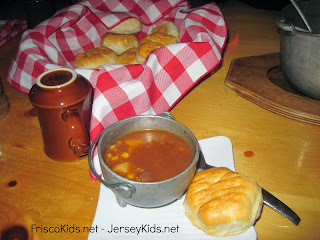 We were greeted by the staff, and served hot beef barley soup with biscuits in very cute cauldrons. They gave us a pitcher of hot chocolate, as well as shots of peppermint Schnapps for the adults. Yum! They took our order for soda (included) and alcohol drinks (not included, but reasonable). 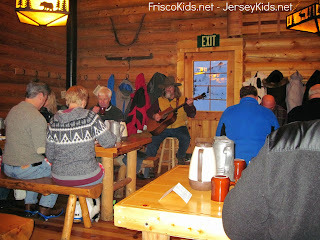 Randall, our cowboy singer, rode over with us in the sleigh, and brought his guitar to entertain us during the evening. He had a list of songs he could play, and he went table to table to take requests. If you wanted to play the guitar too, he was happy to let you take a turn. 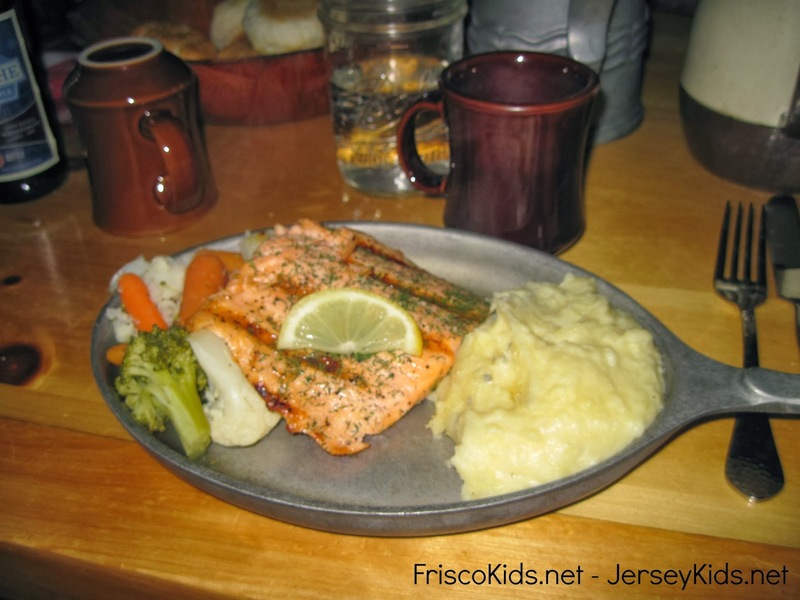 We preordered our dinner, each family member choosing a different option: salmon, steak, hot dog and chicken breast. The rest of the meal was the same. The mashed potatoes were DELICIOUS and they said the secret ingredient was whipping cream. Uh oh. For dessert, we had a wonderful hot apple pie with vanilla ice cream, and I regret I was too full to eat it all. Bring some cash for gratuities for both the entertainer and the dinner staff. 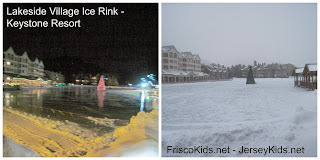 The ride back was much colder and darker (the picture above was the ride there). To be honest, it was harder to enjoy the ride back in something like 8 degree weather, and we were happy to make it to the heated bus. Apparently we were there during one of the colder spells - lucky us! In any case, we had a great time. Of note, they also offer non-dinner sleigh rides, that are less expensive and less time consuming than the dinner rides. Read more about those options here. I was able to slip away for two hours to enjoy time at the Keystone Spa. It was such a cold day it took about an hour for my legs to return to their pasty white color, instead of the red color they turned! 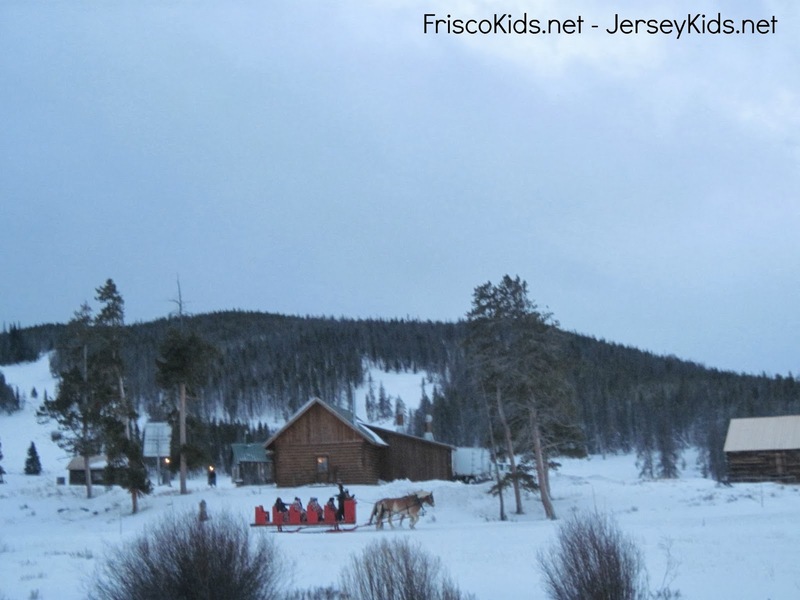 The spa is at the Keystone Lodge, and I took a free resort bus there from River Run Village. It was a bit of a maze to get there - going from the lodge entrance on the 5th floor, down to the 1st floor, down a hotel hall, out of door into an industrial staircase, up and down that, and down another hall to the spa building. I knew I was close because it smelled like a spa in the hallway - a good smell! You can also go there from the outside, if you're in the Lakeside Village area. They gave me a quick tour and showed me my locker. I changed into the robe and went to the relaxation room. Since I had 15 minutes before my massage appointment, the attendant brought me a heated neck pillow, which was awesome. In the relaxation room they had various hot teas, water, and trail mix which was mostly macadamia nuts. I'm not complaining. Keystone Spa relaxation room. Photo courtesy of Keystone. The massage was lovely (thank you Ginger! ), and she brought me back to the relaxation room when I was done, along with water, a hot towel, several small chocolate covered pretzels, and an additional heated neck pillow. I was running low on time, but I managed to visit their sauna and hot tub as well. These are coed, so bring a bathing suit if you want to go in, or you'll need to wear your robe. I just put my feet in the hot tub because I didn't have time to change into my suit. They also have an outdoor heated pool (you can enter from inside - there's a curtain to go through) and use that to get to the outdoor hot tub too. There's also a coed steam room. You'll find the usual amenities in the ladies locker room, including a shower with shampoo/conditioner/body wash, a hair dryer, curling iron, mouth wash, hair spray and deodorant. I didn't have time (or interest), but they have a fitness room and a few exercise classes a day (additional fee). They included Pilates, yoga and I think Zumba. The spa facilities are included if you're getting a treatement - not sure about the classes, though. You can pay a day use fee just to use the facilities. We were too exhausted and busy to use the Keystone ice rinks, but they were lovely. Both are outdoors. You'll find a small one at River Run Village - Dercum Square to be specific. It's near where the free resort buses drops you off. It's across from the Kidtopia headquarters, where the pottery painting studio is. Ice skating is free with your own skates. Rentals are extra. We fell in love with the rink at Lakeside Village. This is apparently the largest Zamboni-maintained rink in North America. You can see it in the picture above at night (with the lit tree in the middle) and with snow covering it. They do charge for admission and rentals for this one, but you can also play hockey there! 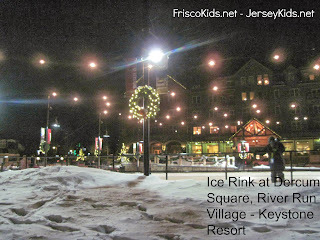 This rink is adjacent to the Keystone Lodge. 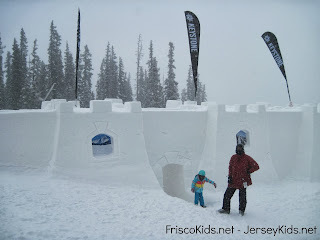 There were additional family-friendly activities we did (and some we didn't have time for) at Keystone. 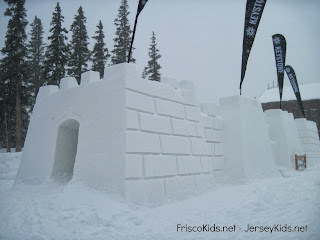 See our Kidtopia post for some of them. 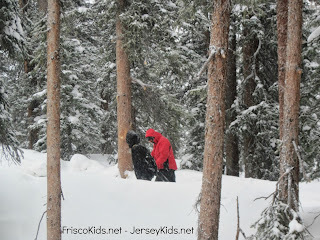 More in the Keystone series. Some links may not yet be live. Disclosure: Keystone hosted us during our visit. As always, all opinions are my own.